Grenada, Carriacou & Petite Martinique are three beautiful islands in the Windward Island chain, connecting North and South America. The Caribbean Sea laps gently on the western shores of these islands, while the Atlantic casts magnificent swells onto the eastern coastline. For the sailors, there are dozens of beautiful, unspoiled islands with a myriad of turquoise bays and anchorages to explore. The Tobago Cays, breathtakingly lovely and totally untouched by today's commercialism. Mustique, conjuring up images of an idyllic lifestyle only glimpsed by a privileged few. Bequia, resonant of days gone by when life was lived at a relaxed pace. On one of our exceptional yachts, either bareboat or crewed, you can cruise through these breathtaking islands in comfort and style. GRENADA BAREBOAT CHARTERS - The ultimate in privacy & freedom, bareboat rentals are for groups having their own qualified skipper. Hiring a captain and or hostess/cook always remains an option. For a list of our available Bareboat yachts, please Click Here. Plan a Grenada sailing itinerary that's full of unforgettable experiences including windsurfing, kayaking, snorkeling and scuba diving in Grenada's turquoise waters. Onshore, this rolling mountainous island is dotted with world famous white and black sand beaches, crater lakes, rainforest and nutmeg plantations that the (spice) island is best known for. Grenada's rum distillery tours are also a must for any seafaring sailor. We invite you to take this Grenada sailing itinerary, and live unforgettable moments. The beautiful places you will see are absolutely breathtaking. With so much to offer around Grenada, you could spend the entire week sailing around Grenada and nearby islands. Enjoy days filled with snorkeling and diving, as well as outings ashore to enjoy the many great restaurants and bars, sandy beaches, fun shopping and inland tours through rum distilleries, spice plantations, rainforests and waterfalls. In this amazing sailing itinerary you and your crew will have time to snorkel, hike, visit rum shops, watch animals like turtles and pelicans , buy original wooden crafts by the locals in Bequia, and enjoy caribbean perfection! Plan your trip sailing around Grenada and nearby islands. 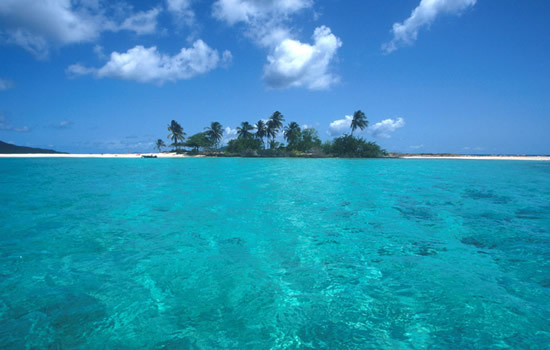 Enjoy a whole day in the beautiful Tobago Cays, and another full day in Carriacou. You will have an amazing vacation filled with snorkeling and diving, as well as outings ashore to enjoy the many great restaurants and bars, sandy beaches, fun shopping and inland tours through rum distilleries, spice plantations, rainforests and waterfalls. In this sailing itinerary you will visit breathtaking places like Bequia, Mustique, Tobago Cays, Salt Whistle Bay, Chatham Bay in Union Island, Petit St. Vincent and the spectacular Carriacou. In this sailing itinerary you will visit breathtaking places like Salt Whistle Bay, the amazing Tobago Cays, Mustique with it's lovely beaches, Bequia, Canouan - an island that combines luxury and elegance with natural beauty, Petit St. Vincent and much more! An unforgettable vacation awaits. Departing from True Blue Bay Marina. In this sailing itinerary you will visit breathtaking places like Carriacou, the amazing Tobago Cays, Petit St. Vincent and much more! Start your sailing itinerary departing from True Blue Bay Marina. You will visit breathtaking places like Carriacou, the amazing Tobago Cays, the charming Bequia, the private island of Mustique, Pitons in St Lucia and much more! Take a day ashore and follow the foot trail along the windward coast, through banana and coconut plantations, to La Soufriére volcano, or on the leeward side. Trinity Falls can be reached by following the trail from Richmond. Forest walks, sports fishing, horseback riding, rendezvous diving, island tours are also some attractions on the islands, we would be happy to provide you more information or make reservations for you. 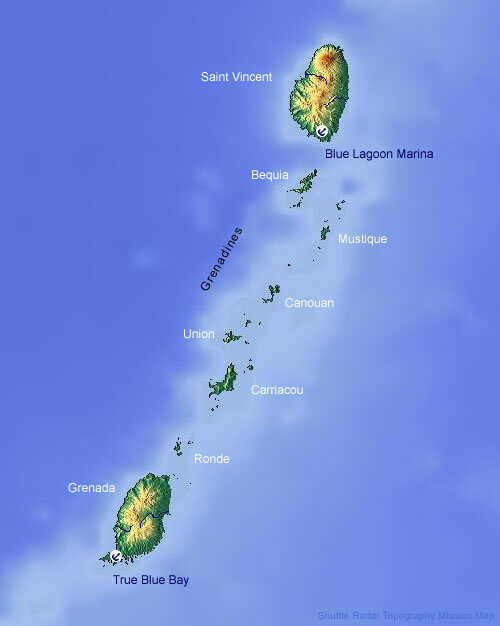 For more information on diving and the main attractions in St. Vincent and the Grenadiens, please Click Here. Grenada Island Description & Information: For a useful description of each of the islands and their main attributes. Grenada Practical Travel Info: For general travel information and tips, sugestions, safety, transportation and more.